I was running out of options, in regard to clearing snow. 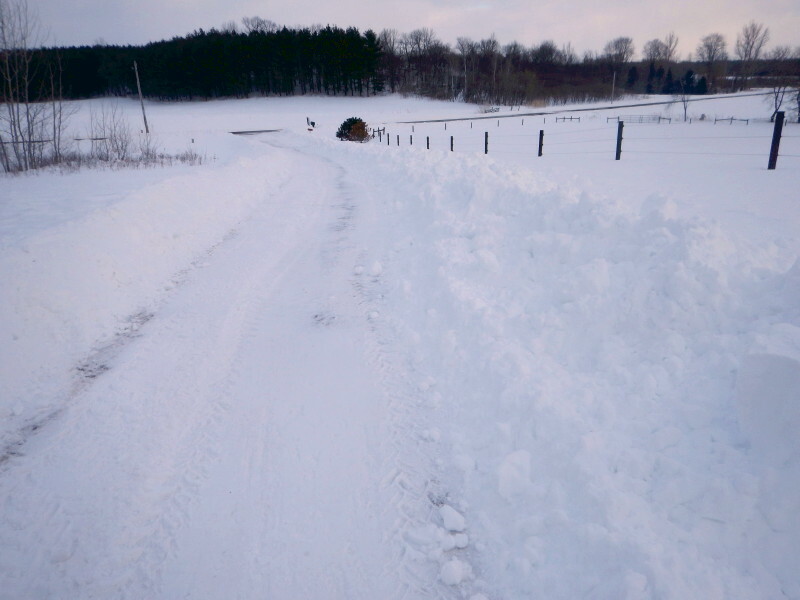 In addition to the advancing drifts narrowing the bottom half of our driveway, we are facing the possibility of more heavy, wet snow this coming weekend. If I don’t open up some space, the next snowfall would really be a pain to clear. Necessity being the mother of invention, I needed to figure out a way to open more width along the rise where the drifting occurs. 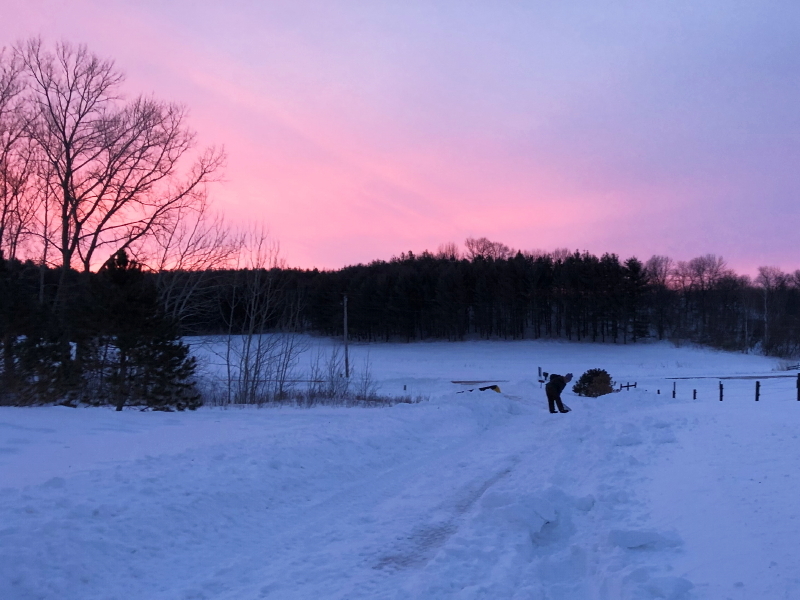 It was tedious, but using the most available tool –our Grizzly plow– I decided to make a series of 45-degree pushes in little “bites” to move the bank out wider. In the first 20 feet, I got stuck twice, and needed to shovel my way out. Getting hung up like that was not going to cut it, if I was going to finish this project all at once. I needed to alter my technique. I decided to skip ahead to focus on the narrowest section first. 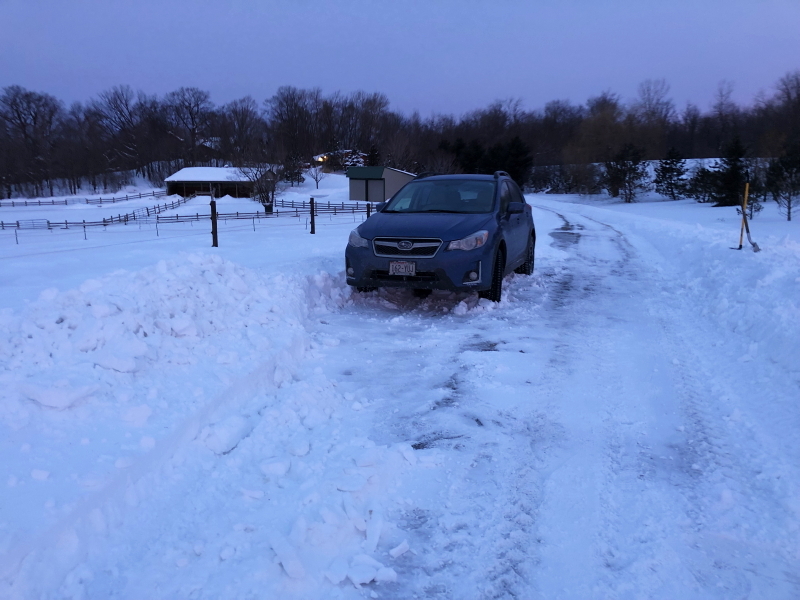 If getting stuck was going to keep me from getting very far, I should at the very least widen the narrowest portion of the plowed driveway. I can’t say it was any particular savvy on my part, other than recognizing what was happening, but my switch to a new spot arbitrarily reversed my direction so that I was cutting into the snow bank from the opposite angle. In so doing, I ended up pushing first with the skinny side of the plow blade. It quickly became apparent that this orientation facilitated backing out, while coming from the other direction was getting me hung up on the wide end of the blade. I didn’t get stuck once finishing the rest of that whole southern stretch of the driveway. John – 1; Drifts – 0. I’m taking a little evil pleasure in Cyndie’s report that she spotted a lot of fox tracks along the southern trail yesterday, because I know there are no longer any easy pickings to be had here. Driving home past the neighbor’s farm, I took particular interest in how many of their chickens were wandering about in the thoroughly exposed wide open. I will be completely befuddled if the fox visiting us from the woods between our land and that neighbor’s has been ignoring their flock. Hoping we get a chance to chat with them about it soon. Meanwhile, I’ve been playing around with ideas on how we might proceed with our next twelve birds in light of the recent carnivorous outburst by the wild little member of the dog family. How about we domesticate the fox like we do dogs? We trap the fox and attach a shock collar. We still don’t know if it’s a male or female. Since pups are born needing total care from the momma, it’s the father that hunts for the kits when they are young. Our visitor could be either. We place customized high technology chips into each chicken, programmed to trigger the shock collar within 20 feet proximity. Then we sit back and watch the perfect solution play out. If foxes are so intelligent, it shouldn’t take long at all for this one to learn that our chickens are now off the menu. It could even become a money-maker for us. We could offer to “chip” our neighbor’s chickens, too, for a small handling fee. Maybe, as long as we’re stretching reality here, we could also have the collar release a scent of moles, voles, and rabbits after the fox leaves the chickens alone, to entice it toward a more preferred hunting focus. In a world where we are moving toward driverless cars, smart speakers that control home life, and robots with unknowable artificial intelligence potential, my simple chicken protection/fox control idea seems downright quaint. It should come as no surprise that I am a person who sees love as the magic ingredient of our lives. Love is the simplest solution to every problem. Then why isn’t everything rainbows and unicorns? Well, just because we know something works, doesn’t automatically guarantee we will put it into healthy practice. Why do people smoke when they know the physical consequences? Why do we make poor food choices or over-indulge in mind altering substances? Why do we stay up too late? Why do we sabotage our own intentions to become our best selves? Nobody said it was easy. I do say it is simple, but that’s not the same thing. There is one critical ingredient to the art of loving ourselves to the fullest, which enables us to then successfully wield love as the key method of reaching a healthy solution… with other people, with situations, business transactions, relationships, governments, and ultimately between nations of our world. I have recently come upon a couple of articles I’d like to share that nicely frame key aspects of emotional well-being. They express opinions in common with my perspectives about emotional health and love. The first, by John White, describes emotional intelligence as a skill that can be learned and developed. The second, is a three-question interview in September’s National Geographic magazine with U.S. former Surgeon General Vivek Murthy, where he advocates for emotional well-being. White describes emotional intelligence as having five components: Self Awareness, Self-Regulation, Motivation, Empathy, and Social Skills, and then suggests skills a person can practice to enhance them. Murthy says we can cultivate emotional well-being with simple tools like, sleep, physical activity, contemplative practices, and social interaction. In his third answer, his words fully resonated for me with his belief that there are two emotions that drive our decisions: love and fear. I hope you will follow the links of the images to read the full (brief) contents of their messages for yourself. At Wintervale Ranch, we are all about the love, and Cyndie and Dunia offer several workshops that provide wonderful information and guidance about emotional intelligence. Bolster emotional intelligence and unleash the power of love. The world will be a better place, and the people a happier human race. That’s my sermon for today. Get out there and share the love! Yesterday, I wrenched success from the jaws of failure after I reacted thoughtfully and purposefully to the engine failure of our lawn tractor in the middle of mowing the hill of our back yard. With barely a minute of pause to simply sit and contemplate the predicament, I decided to spring into action. I was racing the weather. 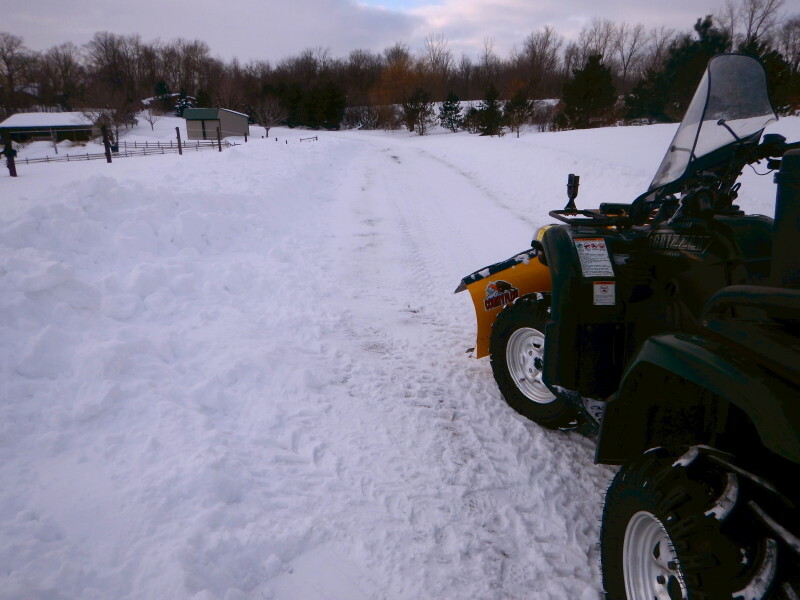 After a quick test to see if I could push the tractor uphill, I went to get the ATV and a nylon tow rope. It was possible that the mower was just low on gas, but it was way too soon to have used the entire tank, based on previous experience. I was concerned that maybe the engine was working harder than usual and burning more fuel. That deserved attention. There was evidence to support this possibility. You see, I was in a hurry to beat the coming rain, so I started early enough in the day that the dew had not dried off the grass. There were sticky wads of wet cuttings littering the lanes where the mower had already passed. It was likely the bottom of the deck had become caked with dirt and grass that was severely hampering the efficiency of the whole operation. Despite the time pressure of impending precipitation, I disconnected the deck to pull it out and flip it over to clear the debris. Working quickly, I did a perfectly imperfect job of sufficiently completing that task. With the deck out, I wanted to grease the three spindles, but remembered I hadn’t reloaded the grease gun last time it sputtered out on me. What better time than right then. Usually, for this kind of task that I rarely deal with, I struggle to recall how I did it last time, and make six mistakes before figuring out the simple technique. Yesterday, my intuition was strong, and I got it right, first try. About then, Cyndie arrived to report the line on the power trimmer had run out. I popped off the spool for her, grabbed some remaining lengths of nylon line I’d been wanting to use up, and wound both the upper and lower spools without my usual mistake of starting with the wrong one first. 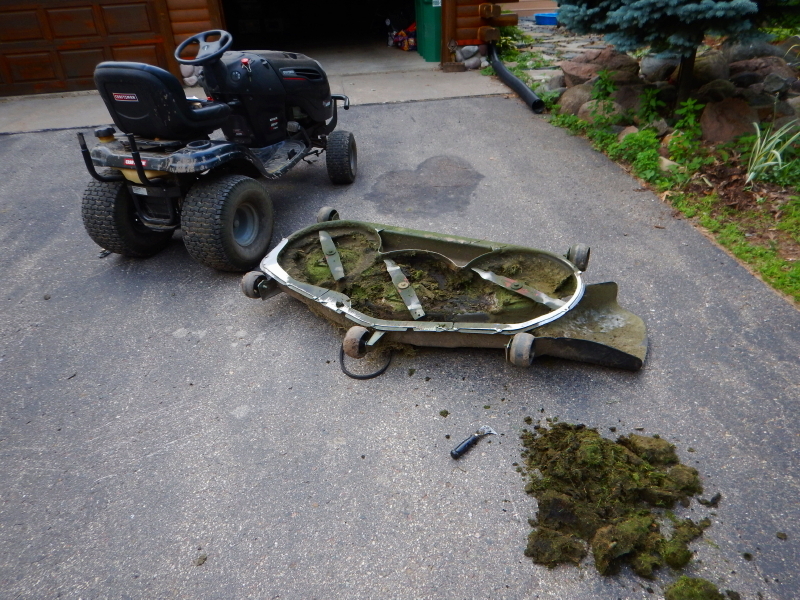 Since I had the nozzle on the compressor hose to blow off the mower deck, I also blew off the business end of the trimmer for Cyndie and sent her on her way before finishing the task of remounting the deck under the tractor. We were both back to work after minimal delay and the lawn tractor worked like almost new. Honestly, the smooth sailing I experienced was in sharp contrast to the norm of multiple struggles to make minimal progress. Tasks certainly do get incrementally easier with repetition. Despite the unplanned delay right in the middle of mowing, I squeaked out finishing the entire job just as the first drops of rain arrived. 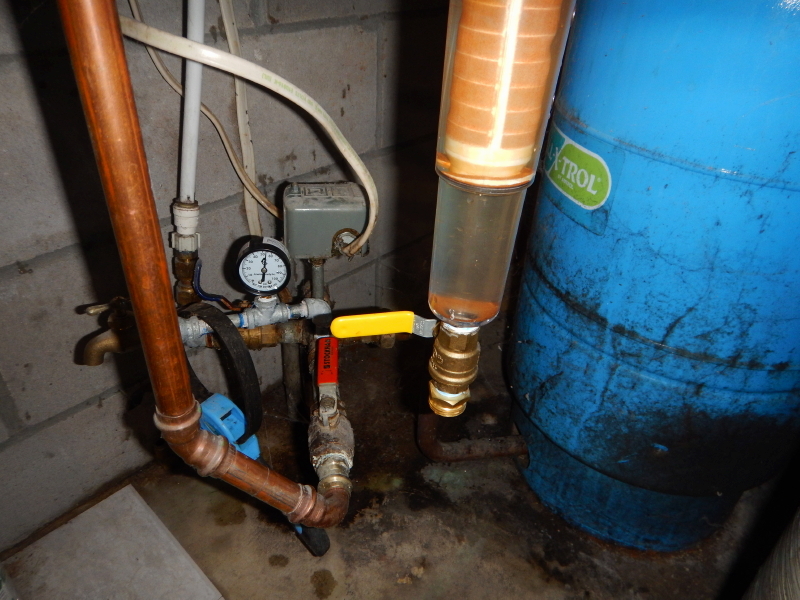 Now, if only this run of success will carry on into figuring out why the pond pump doesn’t turn on again after Cyndie shut it off to clean the intake filter. 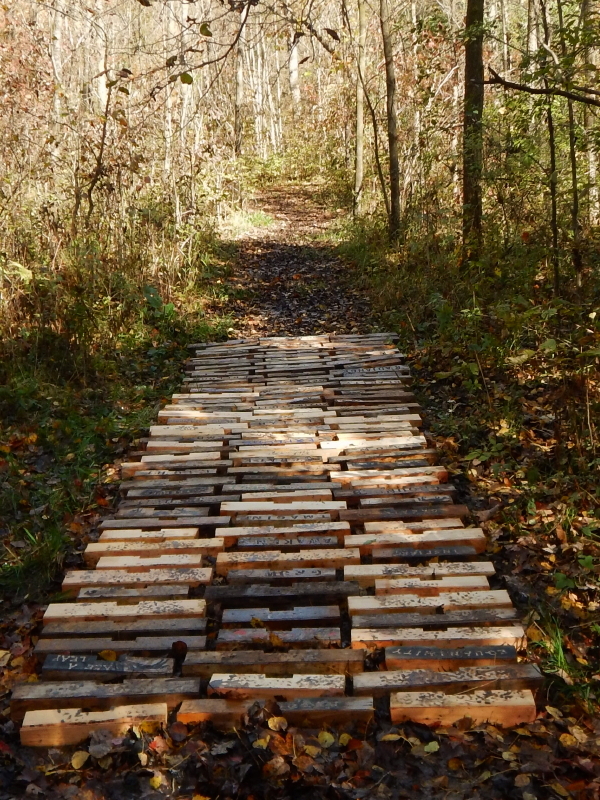 We are experimenting with a new way to improve a particularly wet and muddy portion of one trail through our woods. Originally, I was hoping we could simply cover it with wood chips. It worked for a while, but we haven’t been chipping branches frequently enough to produce the supply needed to cover all of our trails. The piles of wood blocks that I have been pulling off pallets salvaged from the day-job are suddenly proving valuable. Instantly, we have gone from having too many of these lying around, to not having enough to cover the muddy lengths of trail that need the most help. It is interesting to consider the path (no pun intended) these pieces of former trees have traveled. Somewhere, trees are cut down and milled into boards. Then the wood gets cut into these shapes and nailed to pallets. The company that manufactures the products we receive at the day-job mount their units onto the pallets for shipment and charge the end customer for the wood. We have asked if they wanted the pallets returned for reuse, but like so many other things in today’s world, since already paid for, they apparently weren’t worth the trouble. We end up with perfectly good, single-use pallets out of brand-new wood, albeit with four odd blocks nailed to the tops. I’ve been pulling the nails to remove the blocks and using the pallets as a floor in my wood shed and beneath stored hay in the hay shed. I also claimed boards off some pallets to build hay feeding boxes for the 4 stalls in the barn. All the while, the odd blocks that were removed have been piling up. 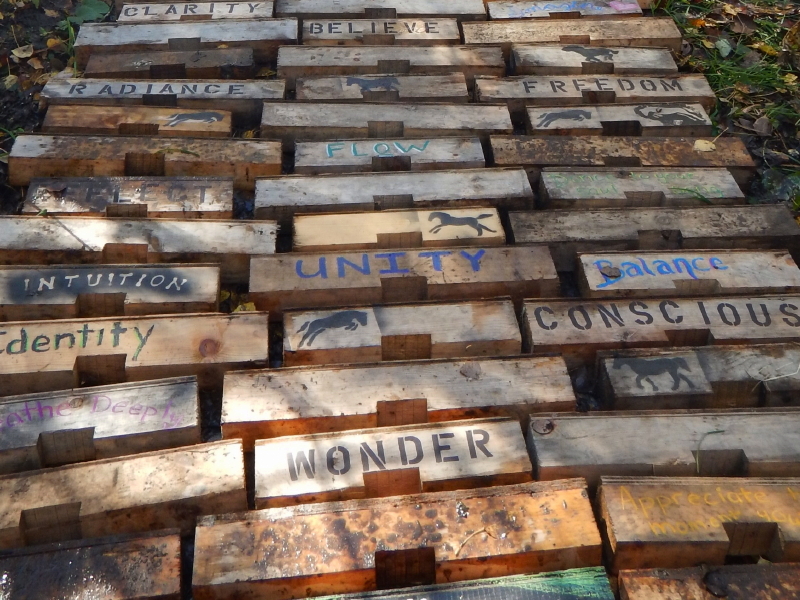 When Cyndie started looking into a boardwalk as a way to get up out of the mud on our trails, we landed on the idea of using the blocks. She wanted to add some words of inspiration and enlisted Anneliese to join her in creating the enhancements. Yesterday we laid down the first test run. So far, so good. Only a couple more miles to go. I hope there will soon be a lot of new orders for that equipment at the day-job. It is poetic justice that we’ve found a way to ultimately bring this pallet wood full-circle, placing it on a forest floor once again.